This is a hydraulic disc brake with opposed 2-piston design. The shim-less caliper mounting, and adjustment and centre lock rotor mounting, simplify installation allowing an easy and fast set-up. 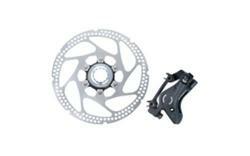 Both resin and metal pads are available and this brake is compatible with International and Post-type mounts.